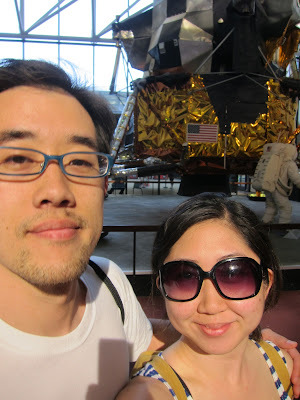 this saturday, chris and i went on a long bike ride through the city and ended up at the air and space museum. one of the best things about living in DC is that most of the parks and museums are completely free so you can easily stop in at a museum for a few hours without worrying about maximizing your ticket cost. at the museum we found the original plane that the wright brothers used for their first successful flight in kittyhawk, north carolina. chris enthusiastically lectured me on all the little placards along the wall. he is totally one of those people who reads every single thing at a museum, which i was a little annoyed by. I prefer to breeze through exhibits without really learning anything. well it's a good thing i have chris bc i left the exhibit pretty inspired by the wright brother's adventure, creativity, and determination. they would not stop until they figured out how to fly, even going so far as to create their own plane engine when they couldn't find engineers who could make what they needed. at the end of the exhibit, you can watch these cheesy animations of what the first few flights might have looked like. i can't emphasize how cheesy these animations were. and yet, when you saw that airplane finally take its longest flight (57 seconds!) it was hard not to marvel at the significance of that event. people were no longer gravity bound. people could fly. 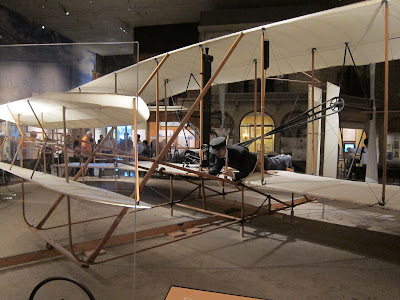 at a different exhibit on that same floor of the museum are aircraft of the modern era, with technological sophistication that the wright brothers would not have been able to comprehend: drones. 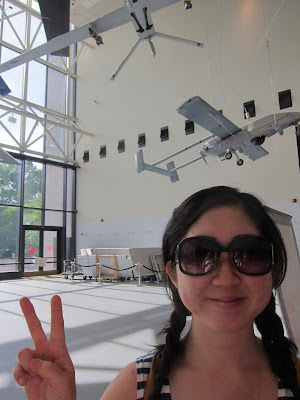 every time i visit the museum, i take a little walk down to the drones display and pray a brief prayer for peace. this time around, i felt a mix of anger and sorrow. how could something as beautiful and simple as that first airplane be turned into something so destructive as a predator drone? not to get too political on this trifle of a blog of mine, but the juxtaposition was too obvious to ignore. i hope and pray that one day the tool of flight can be limited to simple, beautiful things like travel, adventure, joy. i hope and pray for peace on earth. yes folks, that's the real thing! get thee to DC and see for yourself! 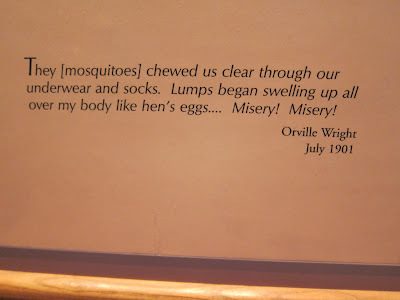 this made me laugh: a quote from Orville about life in kittyhawk. 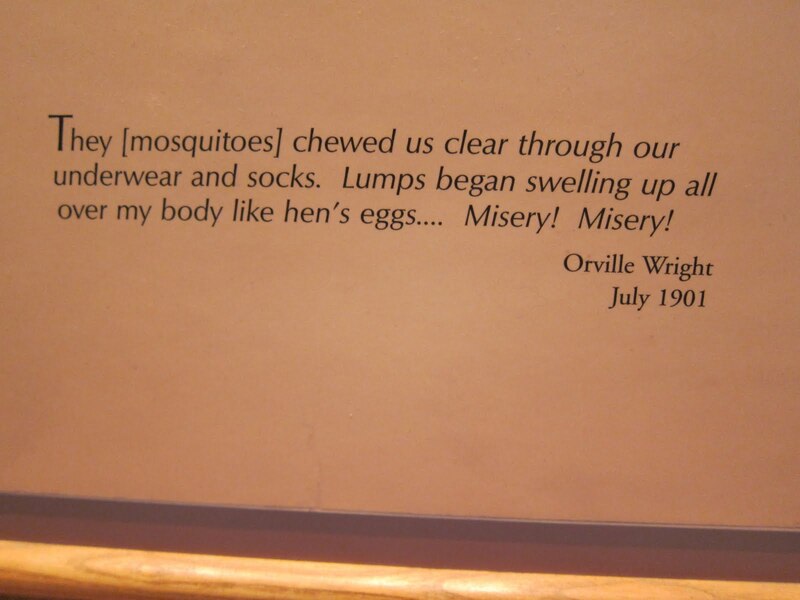 Oh Orville, I feel ya! in front of some space thing? i dunno ... chris will tell you what it is. i very much appreciated this post. thank you! as for the "space thing".... it's a lunar excursion module (LEM). from the apollo moon program. this is not just some random space thing. it is the vehicle that brought a pair of moonwalkers down to the moon's surface for every apollo moon mission, while the commander orbited around the moon monitoring things and reporting back to houston. this "space thing," as bizarre as it looks, enabled humans to walk on the moon! ok, not done. here's the LEM in the first moon landing in 1969. crazy, right?